Do you think this is a fuse problem? Would the tweeter and mid-range stop working if the fuse was blown or not making contact? Does anyone know where I might find a replacement fuse holder? I've looked around the Web, but found nothing. Any good vintage speaker parts sites? I happen to live in Rhode Island (where my Avids were born). Does anyone know of reputable speaker repair shops in the area that you trust with old stereo equipment? Could very well be the fuse--that's what it is for, to protect the mid & tweet. OTOH, the tin foil "fix" is a bit like replacing the fuse in your house with a penny. Sure, the lights will work but whatever caused the fuse to blow will burn your house down. So yes, your drivers "may" be fried. You can test the drivers by connecting speaker wire from your amp directly to the terminals on the back of each driver and playing some music at low levels. Mid should sound fine and tweeter should sound a bit thin. CSP Member Carl is in Connecticut and has a reputation for good work but this may be a DIY project. I'm sure I bought some fuses and holders online. Try googling "AGC-2 fuse holder" or maybe Vern, our speaker fuse expert, has some advice. I'm going to replace the fuse first to see if that fixes the problem. If not, I've decided to have the speaker repaired. I really don't want to give these 103s up. And, I will try to find the correct fuse holder. I didn't even understand that jamming the fuse in with tin foil bypassed the protection until I started reading everyone's comments on this site. (--If the problem is just the fuse, it will be a DIY project, but if it's anything more complicated I should probably entrust it to someone who knows what he's doing.) I did go to the Littelfuse site after reading the previous posting, but there were so many fuse holders! My speakers are high up on a shelf and I'll have to climb up on a ladder to get a look at the intact fuse holder to see what I need. It may well be the one you provided the link to. Thank you very much! I'll let you know. Also, I thought I read that the speakers would still work with the fuse removed, so I began to think my speaker had a much bigger problem. Thank you for giving me hope that is is just a minor fuse problem. I'll be checking the fuse holder and ordering it (I hope) and some AGC-2 fuses this weekend. I will report back on how it goes. Thank you very, very much for your help. I really appreciate it. When I google "AGC-2 fuse" I get something like this: http://www.galco.com/buy/Bussmann/AGC-2 It is a glass 1/4" x 1-1/4" fuse. I don't know the difference between AGC-2 and AGC-3, but PE has this http://www.parts-express.com/pe/showdetl.cfm?Partnumber=071-500 for 1/4" x 1-1/4" fuses. I actually just bought some for my radios and could send you a couple for $1.60 ea + postage. I don't know how many amps you need and whether fast blow or slow blow. Best to look at your remaining good fuse and see what it is. The Avid 103 takes a 2 amp quick acting AGC-2 fuse. A member named Rizzoj2000 posted pages from an actual Avid manual on the "AVID 103 fuse size" thread. That was great! I also learned that the model 103 is rated 20 watts minimum and 150 watts maximum. (I have a NAD 314 amplifier and just bought a NAD 4220 tuner which should arrive Tuesday! That's what got me moving on the speaker problem.) There is also information on the balance switch settings which I never really had a clue about and always kept in the center position. Good to know there is no correct setting and I should just play with it until I find what sounds best in the room. This website has already given me so much information. I'm at work now and can't wait to get home and up that ladder to see what fuse holder I need! I'm very hopeful now. One more, possibly stupid, question... The 103 speakers are up on a shelf near the ceiling and they're both lying on their sides. Is that okay or should they be upright? Thanks again. Speakers on their sides is no problem. A "quick acting" fuse would be a fast-blo. well that's a different animal. 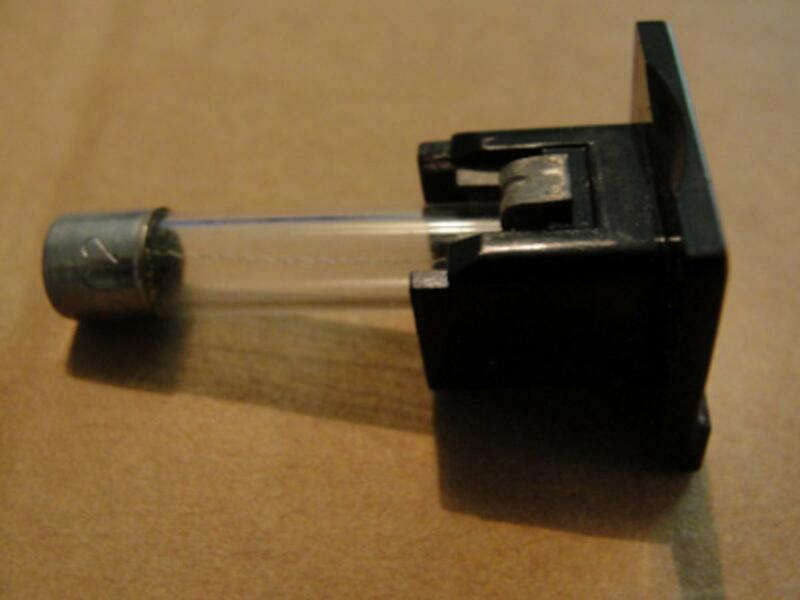 An AGC-2 is a glass fuse. Better to wait until you climb up there. Maybe post a photo of what you have. Ha, Kent, you were absolutely right. Much better to wait until I climbed up there. And I did just climb up there. I switched the fuse holder and fuse from the working speaker and into the broken speaker and the formerly broken one sounds wonderful! It IS just the fuse. Attached is a picture of my fuse holder (black).It's really no more than a cap that snaps in. My tuner arrived today too. Earlier than expected. It's been a very good day for audio. Thanks very much for your interest and patience. When the original 5/8" Littlefuse square chassic style chassis fuseholders were made, they came with the ordered body colour and cap colour. The fuse was always included and a warning that if the cap was installed in the body, without a fuse, it was basicly a writeoff, as it wil not come apart, without breaking them. The caps were made in 4 or 5 or more different colours, I have an old catalogue. If the cap is an OEM original then you only have the different colour cap, bezel contrast to look at. Some tv repair shops, electrronic surplus sources or hobby shops may still have black units or just caps onhand. 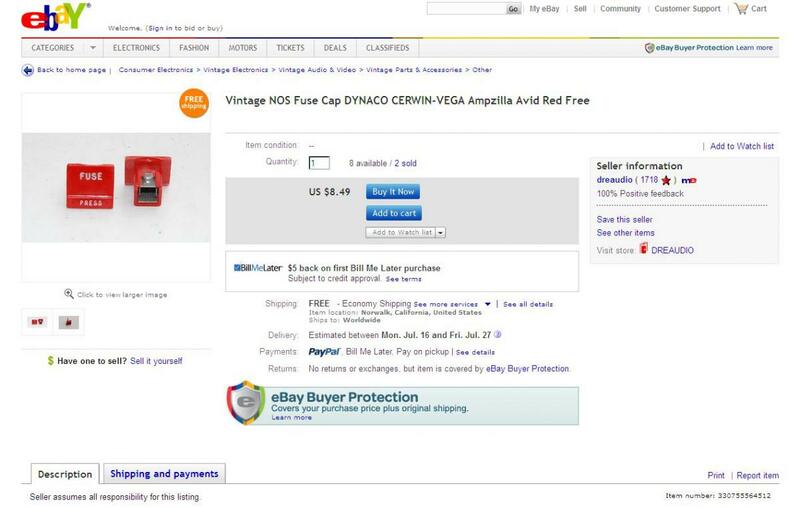 You may see Dynaco 400 amps on ebuy with their black bezels and red caps. Be cautious when shopping on the net. Littlefuse like or similar to Littlefuse fuseholder is in all likelyhood not made by Littlefuse. There is at least one clone fuseholder being sold on ebuy, likely offshore production. When you remove the cap you can only see the bezel, or picture frame. If you are lucky enough to live in an older, larger, US city, you should be able to find electronic surplus stores with these on-hand, New York especially. I received the little red fuse caps and the AGC-2 fuses and popped a cap and a fuse into the broken speaker --and it's working wonderfully now. The fuse cap clicked in and fit perfectly. No more tin foil! And I don't really care that the cap is red since I keep the grills on the speakers so the cap isn't visible. But the part that is confusing me is... The seller did say that he was selling just the caps. So am I still missing the body of the fuse holder? (My other speaker only had a cap and a fuse --no "body" either.) And if I am still missing the body of the fuse holder, does it mean that by just using the cap and fuse I'm still bypassing the fuse protection? --Is using just cap and fuse the equivalent of tin foil? In the end, the speaker is working and sounds great so I'm happy. I'm just curious about the fuse holder. It doesn't seem that the slot that the fuse fits in is big enough for another piece (the body).